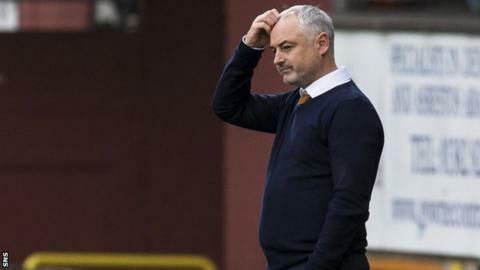 Dundee United have parted company with manager Ray McKinnon following back-to-back league defeats. The Tannadice club currently sit fourth in the Championship, five points behind leaders St Mirren. "It been an honour and a privilege to play for and then manage my hometown club that I have supported all my life," McKinnon said. "I wish the club every success moving forward and I'm certain they will be back where they belong shortly." McKinnon was appointed United manager in May 2016, after guiding Raith Rovers to the Championship play-offs. The former United midfielder could not prevent Hibernian winning the Championship during his first season in charge, then lost the promotion play-off final to Hamilton Academical. A 2-0 league defeat to Inverness Caledonian Thistle last weekend followed a loss to Livingston in United's previous fixture, prompting the United board to review his position. "It is disappointing that my time as manager of United has come to an end," McKinnon said. "I would like to thank the fans for their support over my time in charge. Also, I'd like to thank everyone at Dundee United for their efforts during my tenure."